On Sunday I ventured forth with my understanding friend Kal Malik. We made our way into the Derbyshire hills again in the trusty steed Peugeot, rods clanking away in the car’s side pockets, and in the engine as we attempted to negotiate the Cat & Fiddle route across to Buxton, and on towards Ashbourne to get to Arbor Low stone circle. The sky soured as we got towards Macclesfield and we knew we were in for another damp encounter with the Stonehenge of the North. Sure enough it started to make the wipers work hard as we got nearer. We turned into the small lane and got prepared. Kal, as usual, opted for his trusty knackered trainers and sponge-like suede jacket. I’d remembered to wear proper walking boots this time, and felt like it was a sensible decision. The rain got worse as we neared the circle, and we gave a knowing look to each other of “let’s make this quick!”. I immediately asked for a female energy detection and walked from the entrance towards the centre stones. I got a cross and walked on. At the smaller ring it stopped responding, so I switched to “detect male” and it crossed again, getting stronger towards the centre. Then the rods parted again, and I switched to female for the last few feet to the centre stones. Kal was looking puzzled and increasingly soggy. “Do it again.”, he nodded. Same. “Hmmm…I got the opposite.” he remarked. I decided to try following the energy lines instead of detecting their size and position with the two rods. I had become accustomed to following single paths, rather than tracing areas. I started at the entrance and asked for female. Immediately I found a line close to the left side of the entrance gap. I followed it past the surrounding mound and into the ditch, where it spiralled to a point. “Kal – I’m getting female in the ditch?”. “Then you’re doing it wrong.” came a bemused response through the veil of raindrops now bucketing down on us. “Hmmm…” mused Kal, “I think I know what it might be….”. He left the thought hanging and wouldn’t elaborate just yet. The rain running off my jacket and hat had formed a confluence in my jeans pockets and I was sinking. “Abandon ship!” I was thinking furiously, and I proposed we beat a hasty retreat to somewhere warm and well-stocked in the cake department. I knew he’d suggest his favourite café in Bakewell. “TOP” sandwich and a chance to dry off? Done deal. The sun broke through the clouds as we munched into our scran. I figured the next place to try was G—- Edge just ten minutes car drive away on a road out of Bakewell. It was close and new – possibly something and nothing? It seemed to have a lot of stone cairns and a standing stone on it, so it had potential. We parked next to the Robin Hood pub (feeling good about the coincidence of The Green Man and the energies appearing so often in this trip). Casting around for the path we walked up the road and found a path very quickly leading up the ridge. 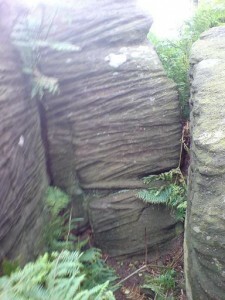 It was labelled “Birchen Edge” on a green sign. “Though it was something beginning with ‘G’?” I thought to myself and walked on. On the way up Kal experimented with finding an energy on the path and quickly located one winding its way up the ridge path. He got bored following it and stopped just as we arrived at a fork in the pathways next to a many-trunked birch tree with a large stone at its base. Here the path went on wards and also turned right up the hill quite steeply. I dowsed that the right hand path was the better option, because its energy was linked to the stone’s, and we headed up, forgetting about Kal’s vertigo. Well, I forgot about it – not sure if he did. I had liked the tree too. 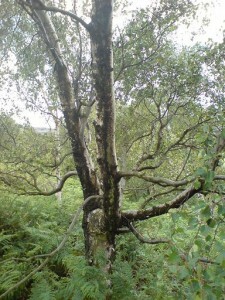 A birch – the emblem of the first stage of Druidry. The symbol of renewal, seeing afresh, learning new ways of being, and looking with child-like wonder at the world. What had I read about many-trunked trees being more powerful? That seemed to tie in with the Delamere experience, when my “quest” had ended with a Pine and Birch tree living together at the corner of a junction of paths. That was the day I had recognised the unmistakeable significance of the smoothed beach stone in amongst the ferns on an energy path. I had recognised that it had both purpose and meaning, if only I could let them emerge when they should. At the top of the ridge the path smoothed out to a gentle uphill amble next to a large expanse of heather to our right. We started to notice the ridge. In amongst all the trees was a fantastic protuberance of rock with a ready-made man-sized sentry position looking out over the whole sweep of the surrounding valleys. I came back to my senses with the last thought ringing in my ears. Look for the bird! I told Kal. He said nothing. I could hear birds singing, but as we headed back to the path to investigate more of the unusual rock formations on the ridge I kept hearing a songbird in the trees further back down the path we had climbed up. I didn’t feel ready to go back yet, so we walked on up the path. I was on the lookout for flying birds, but none were around, so I put the thought away for the moment to concentrate on more “real” matters of finding energy lines. We tracked a line up the hill with the directive “Find the most powerful energy source on this ridge” as we trudged upwards. Soon the sight of three massive fifteen-foot high rocks and an obelisk topped by a ball came into view in the middle distance. The path was heading for them, and we gave each other a look which said “It’ll be them that we’re heading for then.”. Suddenly we were heading into the heather to our right, following what looked like a rabbit path. 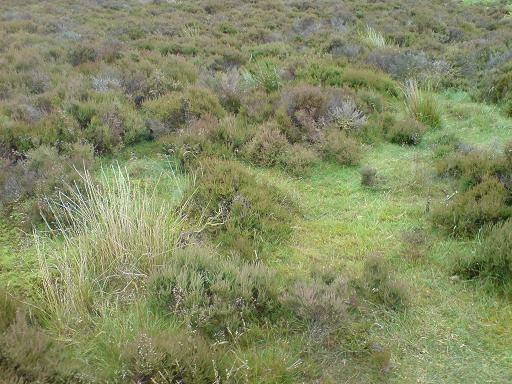 Then a swerve left to circle into a spiral around a faerie ring in the midst of the heather. 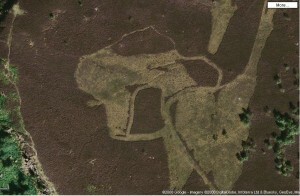 It was unmistakeable in nature – light green moss atop a lush grassy mound, and then the heather all around. We spotted a large animal-sized stone and dowsed towards it. From there we picked up six more stones in a circle around the faerie ring and stunted heather centre point. 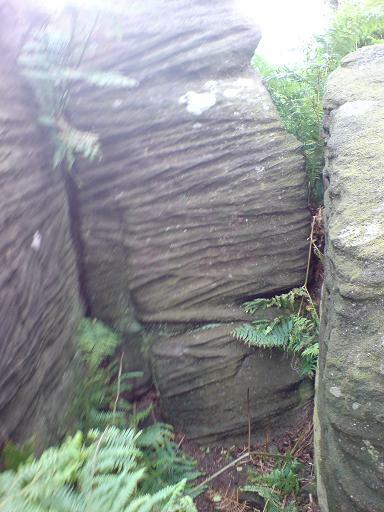 Most of the stones were invisible until you stumbled onto them in the heather, or could scrape the moss off a corner in order to identify them. 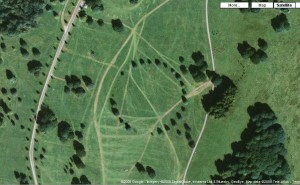 Unmistakeably a circle! But invisible from the path twenty feet away. We walked back to the path and on to the Nelson’s Monument area where the obelisk and three large stones were. They were all very interesting, marked as they were by roughly-carved slogans – “Defiance”, “Victory” and “Royal Soverin [sic]”. On a stone beneath them was the artist’s initials “G.C.” and “1766”. A good year for patriotism, I believe, if not for spelling. As we wandered around the stone, Kal into the heather, me around the big stones, I spotted a pigeon on one of the huge stones that formed the ridge next to the monument. Despite the undoubted updraft from the ridge it was sitting there without shifting, and seemed to be inviting me to join it on the rock in the warm afternoon sun. “Look for the bird. Follow the bird. “ I thought, and began to approach the rock slowly and deliberately. The bird never stirred. I climbed the rock at it lowest point and slid myself up the rock until I was lying on my back in the middle, three feet away from the pigeon. I expected it to flap and fly at any second, but it just watched me, head bobbing and flicking whenever I moved. I lay there quietly for a minute then ventured a look at the pigeon. I could see it was being blown by the winds, but it hadn’t flown yet. Now it started to move away from the edge and walked in a clockwise fashion on ever-increasing circles and then stopped to look me in the eye. I gulped. It had a crap, then walked to the farthest edge away from the ridge and stopped. Then it came back to the top of the rock, and stood on the ridge again, looking out into the valley. I slowly turned until I was lying flat and could see what it could see. “What do you see, pigeon?” I asked it out loud. “How do you find your way? How can I find mine?” I chuckled to myself at the ridiculousness of throwing a metaphysical quandary at a humble pigeon. I was really beginning to lose it with this “communing” lark! 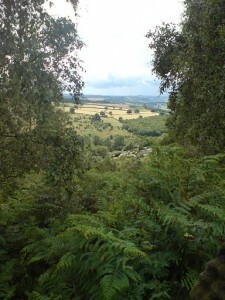 I sighed, relaxed and gazed out over the landscape. I looked straight ahead – there was a church spire. I looked at the pigeon again – it was looking at the church too, I believed. Then it looked left a bit. 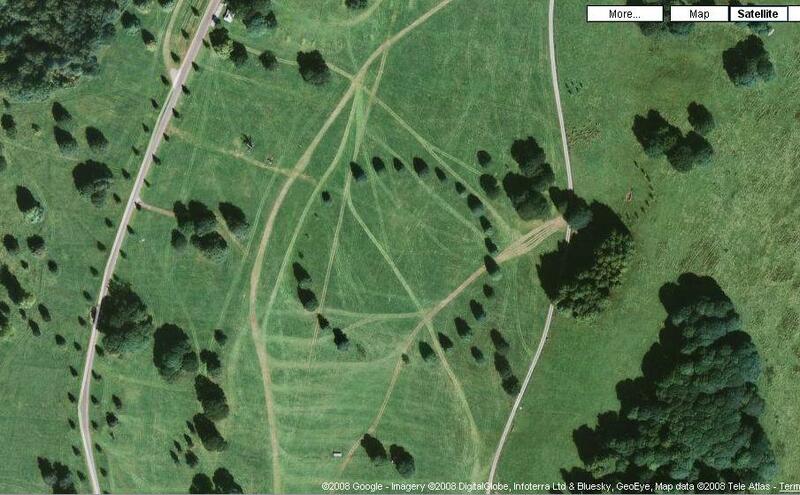 I copied it, and my eye was transfixed by the shape of a circle marked out in a field by trees. A grove circle? A druid’s grove tree circle? I looked back at the bird. The bird had got bored with staring and waiting around, and had wandered off to the back of the stone again, where this time it flew off back down the path we had come up. I reeled from what had just happened. Had that bird just shown me a site that only I would be particularly interested in? How else would I have found that? Why did I find it today? 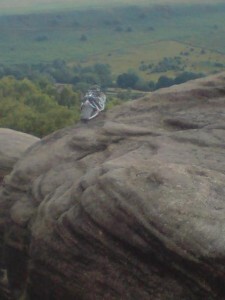 Why hadn’t that bird flown away as I climbed onto the rock with it? At one point I had been only inches away from it? What the hell was a pigeon doing on that ridge? Of course – he had tags on – he was just resting and preparing to navigate back home. He was just showing me how he too uses the alignments and energy lines to find his path out and home again. It was a shared interest. Then, I am convinced, he led my eye from the church spire to the Druid’s grove circle. Of course, I could have seen it just by studying the view at any time, but I still felt like I had been meant to be the one who saw it, and that the bird was helping in some way to make that happen. Craziness, I know. Whilst all that had been going on Kal had been tracing a serpent energy through the heather and had found another, larger, circle a short distance behind the three large stones dedicated to Lord Nelson. I verified it’s centre and stones, and then I told Kal about the incident with the bird. “Well, “ he said, “You followed the bird!”. Indeed I had. As we walked back down the path with the sun starting to noticeably begin to descend, I contemplated this area. It was like Helsby Hill, Stanton Moor, Harthill Moor – all magical places where energy gets compressed and invigorated by the rocky outcrops. There were also some many birch trees I could barely overlook the symbolism which was all around me, and the communion with the birch which started it all off. As we descended we came back to the large sandstone block at the base of another birch tree – this one the many-trunked Shiva of the birch trees that we started with earlier. I stopped to dowse the connection between the birch and the rock only to find that it was strong, and the tree seemed to supply not only energy to the rock, but also to both paths up the ridge too. As the slowly setting sun twinkled between the birch branches I felt another magical moment arriving. To awaken it I instinctively started to circle the tree clockwise. On the first attempt I caught my foot clumsily as I stepped over its lowest smallest branch, and I laughed at my own ungainliness. Next time around I stepped over with ease. The third time around I got faster, lightly hopping the low branch like a teenager. On the fourth time around I felt slightly out of control and positively leapt the low branch before stopping myself at the stone and laughing deeply at the build-up of energy I had felt by doing that. It was like the buzz you get off a merry-go-round before you feel too sick. I started to sense the power of these trees. The birch was answering my questions with the patience of a mother. It was showing me new things, making me feel child-like amusement and wonder, and was promoting simple and honest communications with nature – a deeper appreciation for its powers and ways. I was beginning to see the signs and walk a truer path through the first stage of Druidry. Looks like we’d made a good choice to take a wrong turn at the bottom of the hill and come up this ridge instead. Funny how these things work out!